Water is more often than not in short supply and becoming more expensive every day. Garden Solutions Landscaping has an American Rainwater Catchment Systems Association (ARCSA) Accredited Professional on staff. We can help you assess your ability to collect thousands of gallons of water from your roof top then design and install a system to use in your garden. For more information click on the "Contact" page and provide us your information and we will contact you shortly. 2014 was a busy year for installs at local schools. GSL installed multiple systems at schools and community gardens to demonstrate the benefits and capability of rainwater harvesting! Included below are systems installed at Walter Colten Middle School, PG Middle School, PG Adult School and Community Garden, and MEarth. Thanks to CAL-AM for partnering with the schools and funding the efforts. 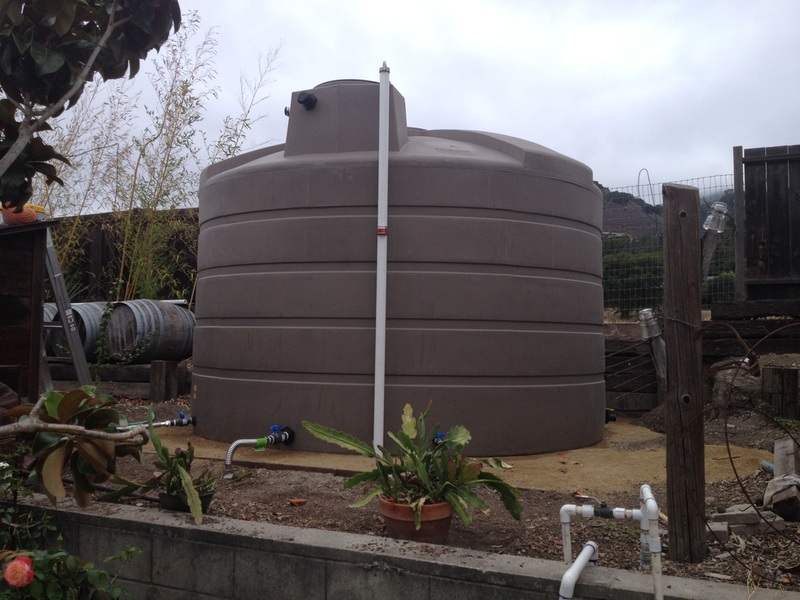 7,800 gallon rainwater harvesting system in Carmel Valley near Garland Park. Have a small footprint to work with? No problem, GSL has the answer! Lack of a large property doesn't have to limit you from installing a rainwater system. This homeowner worked around the space limitations and after consulting with GSL chose a Bushman Slimline system to collect rainwater. This particular Bushman product works well in space limited areas due to its small foot print. 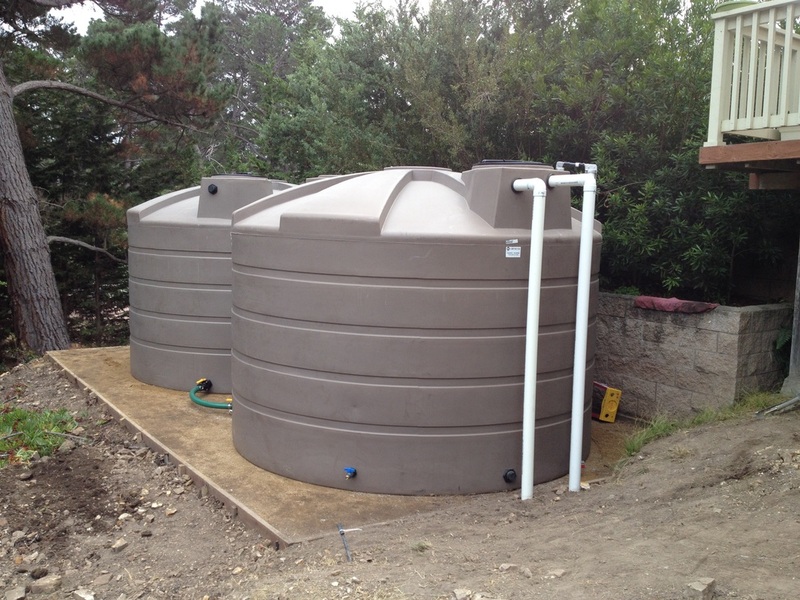 The system below is made up of three 265 gallon Bushman Slimline tanks. Downspouts were replaced with PVC with flexible couplers to allow for minor settling or earthquakes without causing damage. Falcon Stainless Steel flexible pipe was used to connect the tanks together to act as one. A Bushman pump system with a Grundfos MQ3-45 1hp pump will be used to distribute water around the property. Gutter filters and basket filters in each tank screen debris from the system. 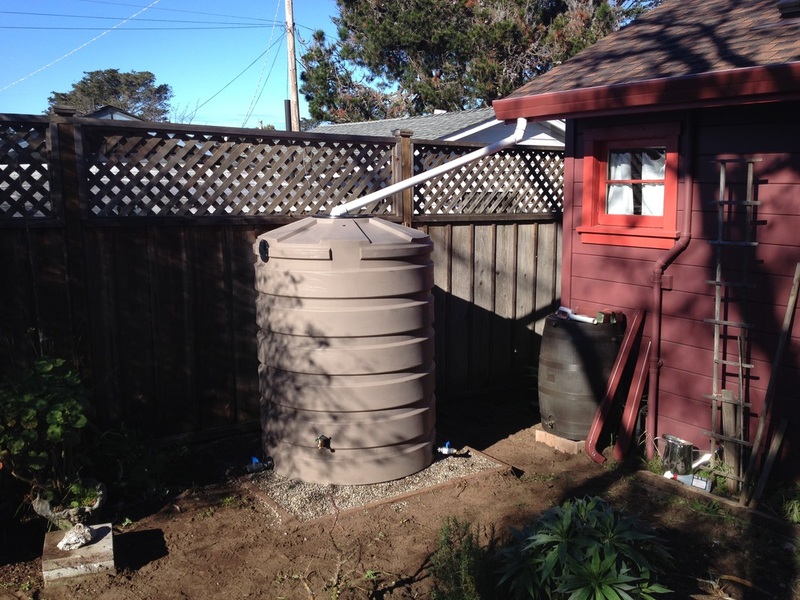 GSL will help this homeowner apply for the $300+ rebate from the Monterey Peninsula Water Management District. 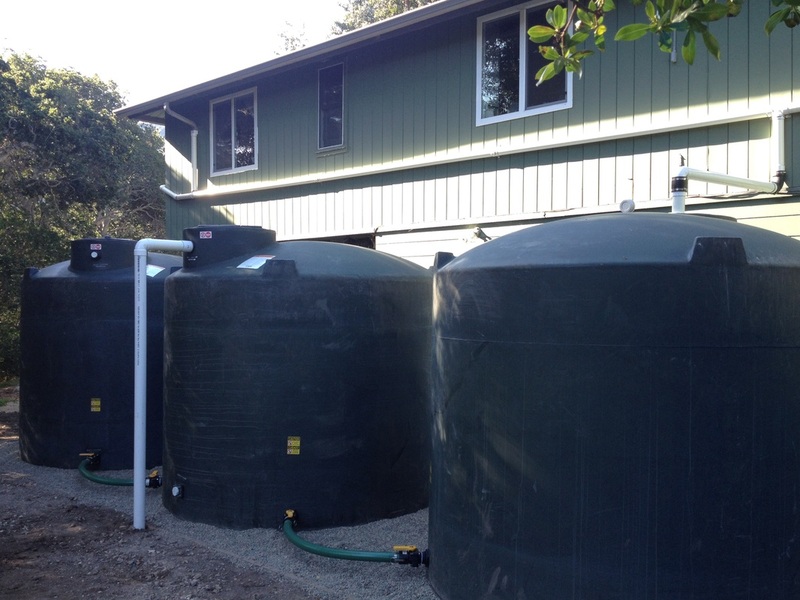 A 5,500 gallon rainwater harvesting system was installed by Garden Solutions Landscaping near Laureles Grade. The characteristics of this system are as follows and are based on the protocols and guidelines developed by the American Rainwater Catchment Systems Association. The ARCSA guideline is based on industry leading standards for the design and management of rainwater harvesting systems. 1) The roof catchment surface consists of over 1,250 square feet and is made of composition shingles. 2) The catchment area will yield approximately 12,700 gallons per year based on average rainfall. 3) The conveyance system included 4 downspouts placed over 100+ linear feet with approximately a 15 foot fall in elevation and installed with 3" schedule 40 PVC pipe. 4) Each downspout was mounted with a Leaf Eater Advanced filter unit to remove sediment running off the roof. 5) An 18 gallon in ground first flush was also installed to remove undesirable water prior to it flowing into the tank. 6) The 5,500 gallon system is made up of 3 tanks total. A 2,500, and two 1,500 gallon tanks which sit underneath the deck. 7) A floating extractor was installed in the 2,500 gallon tank to suction water approximately 6" below the surface of the tank where it is the cleanest. 8) Each tank is connected at the bottom with ball valves on each side plus a Falcon stainless steel flexible connector that allows for flexibility and the management of water between the tanks. 9) The overflows from tank 1 and tank 2 includes Fernco flexible fittings to allow for movement. 10) Calming inlets are used inside of tank 1 and tank 2 to reduce agitation of sediment settled at the bottom of the tanks. 11) An anti-siphon hole was drilled in the top of the calming inlet to avoid siphoning the tank back through the first flush device. 12) Skimming overflows inside tank 1 and tank 2 were used to move water between tanks. 13) Non-potable stickers were liberally used throughout the system in English and Spanish to insure nobody mistakes the water for potable! 14) The water collected will be used to irrigate landscape. The high point will be about 30 feet above the tank location. A Grundfos MQ3-45 compression pump is connected to the floating extractor and will push water throughout the irrigation field. This pump automatically senses pressure in the line and will shut off until needed. In addition the pump will shut down when water levels in the tank become depleted. 15) A mechanical tank level monitor was installed at the top of the 2,500 gallon tank to easily view the water level. 16) At the end of the overflow device a rock pit energy dissipation system was installed to avoid erosion. 17) If you are interested in capturing rainwater and using it to irrigate your landscape call Daniel Resendiz at 831-224-4006. The following series of pictures represent a number of different installations from Carmel Valley to Monterey. They include preparation work as well as the finished product and tanks range in size from 1,100 gallons to 3,000. Garden Solutions Landscaping has the breadth of skills to turnkey your requirements from beginning to end. Let us help you implement your vision of having an alternative source of water that falls from the sky every winter and is usable when you need it in those dry summer months! _You don't have to have acres of room to have a good sized RWH system! These homeowners have a beautiful drought tolerant landscape with lots of potted plants distributed around the home. They wanted to collect rainwater primarily for their potted plants and be able to water them without the use of a pump. GSL excavated a small downhill side yard to place two 550 gallon tanks about 18 inches above the patio area. A ball valve with hose adapter has been placed to allow for easy access and gravity will do the rest. The system includes a Leaf Eater and First Flush unit. A wet conveyance is routed under the paver pathway and block wall to the tank inlet. A flexible hose connects both tanks to allow for movement. Both tanks sit on compacted base rock and decomposed granite rings to support the weight of the tanks when full and provide stability at the site. A tank gauge sits on top of the tank to easily identify the water level. A design element was to place the overflow pipe on the inside of the tank, like a spillway behind a dam. The overflow water moves through an existing 2" bulkhead adapter at the bottom of the tank that would have been capped otherwise. This leaves less pipes hanging on the outside of the tanks. The homeowners are installing gutters and "Leaf Solution" gutter covers to convey a very high quality filtered water to the Leaf Eater and then to the tanks. _The homeowners at this Carmel Valley Village residence are very conservation minded and wanted the ability to capture rainwater and use it in their yard. In this case they wanted "active" and "passive" rainwater harvesting. Active RWH refers to capturing rainwater in tanks and using it to irrigate or wash your car etc. Passive RWH refers to using rainwater, not stored in tanks, to infiltrate into the ground through bioswales. Bioswales allow the water to infiltrate and enhance the plant life around the area. In this case, excess water running through the tank overflow is elevated naturally back into the garden so no water is lost to runoff into storm drains. By far, this was the most interesting project we have done with the use of overflow water and we will follow it through the winter and spring to see what effects it has on the native plants in their beautiful garden. The homeowners also didn't want to see the pipes going into and out of the tanks from the view of their home. GSL buried the lines and took them to the fence side of the tanks to provide this element. One important note is the homeowners had a "Leaf Solution" gutter screen installed on top of their gutters. This is a fine mesh system that keeps out the most minute debris and is the most important part of a rainwater harvesting system providing high quality water entering the tanks. Lastly, the homeowners had a submersible pump installed to provide the pressure required for their irrigation requirements as well as a gravity flow outlet when the pump isn't required. _Garden Solutions Landscaping installed three above ground tanks at a home in Carmel. The homeowner like many of our customers is concerned about the future of water availability and cost. The system installed is the first phase of a larger vision the homeowner has to collect non-potable water for landscape irrigation. This is a great example of how to take an underused area on a side hill, fence it in, and put in water storage tanks that are not visible to the homeowner or neighbors. The system is supported by a roof catchment area of approximately 1,000 square feet with 3 downspouts. The downspouts are connected to 4" corrugated pipe that runs underground and down hill over 100 feet to the tank area. GSL adapted the 4" corrugated pipe to 3" Schedule 40 PVC and ran it into the tank system. Leaf Solution gutter screens were added to screen out any debris from roof runoff in the future. It is expected the catchment area will yield over 10,000 gallons per year. This RWH system also includes a fully automatic submersible pump that will provide plenty of pressure for any irrigation requirements as well as a gravity feed outlet when a pump isn't required. This homeowner is concerned about the availability of municipal water over the next few years. The home has a flower garden they want to preserve in case water restrictions are put in place. The 2,200 gallon system will provide water to keep plants irrigated in the case a "water solution" can't be finalized in time. The primary filter for this installation is the Leaf Solution gutter guards installed on the top of the gutters supporting the downspout visible in the picture below. Approximately 400 square feet of roof collection area will allow up to about 4,000 gallons of rainwater to be collected. The GRAF Quattro downspout diverter captures water flowing down the downspout and funnels it into the tanks. Once the 2,200 gallon system is full any further flow into the system will overflow down the original downspout to the storm drain system. A one horsepower automated electric pump was installed to provide pressure. Currently the water will be used via hose, but a stub was provided for a future connection to the irrigation system.